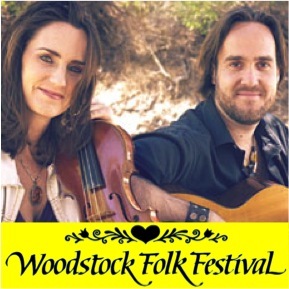 From stunning fiddle and guitar instrumentals to beautifully crafted lyrics, this year's 32nd Annual Woodstock Folk Festival offers something for everyone: Celtic, bluegrass, blues, fingerstyle guitar, Americana, down home swing, jazz, pop, Cajun, country, and both traditional and contemporary folk music. The Festival features a Main Stage, Open Mic Stage, Children's Area, Ukulele Workshop, and a Lifetime Achievement Award. Woodstock is one of the National Trust for Historic Preservation's Dozen Distinctive Destinations - AND, it was the film location for the classic movie Groundhog's Day starring Bill Murray and Andie MacDowell. Come join fellow Tigers for an afternoon of Folk, Friends, and Fun! Many thanks to Carol Obertubbesing '73 for her great work spearheading this wonderful event! Fun Fact: The musicians pictured here - Bettman and Halpin - were first introduced to Woodstock Folk Festival organizers by Edie Canter '80! For a list of other groups playing at the Festival, please scroll down. Pets welcome on periphery of the Square, but not in the park itself. Optional Attire: Orange and Black Princeton gear for some Tiger fun! This event is FREE OF CHARGE, but donations to support the Festival are appreciated and help to make the event possible. Click HERE to let us know you plan to attend, so we may also coordinate car pools for anyone who is interested! Don't forget to answer the questions at the end to let us know if you can offer a ride or need a ride. Thank you! Not yet a member of the Princeton Club of Chicago? Join NOW to receive PCC Member priority reservations, member pricing, and to support Princeton events and community service opportunities. Only $25/year for first-time members! 2:00 Michael Johnathon - Folksinger, songwriter, SongFarmer, author, playwright, creator and host of “WoodSongs Old-Time Radio Hour” offers a variety of "front porch songs"
Stage Left Café Open Mic Stage – Sign-up starts at 12:05 pm, join us and share your talent! Special guests Briar Road (Dan Zahn, Kate Moretti, and Rusty Winchel) perform a mix of traditional and original songs in styles ranging from blues to swing (1:30 – 2 pm). Ukulele Workshop – led by Mark Lyons. Stage Left Café (2:15 – 3 pm). Children’s Area – Hands-on arts & crafts, fun activities & more!